1- Minimize Resistance (or drag). This is done by having the correct positioning on your surfboard. 2- Maximize Propulsion. You will do this by having the proper paddling technique. It’s simply a waste of time to focus on “paddling better” or “paddling harder” until you really understand the concept of “Resistance”, or “Drag” (same thing). To minimize drag is to “glide efficiently” on the water with the minimum of elements “resisting” your propulsion forward. Many things can create resistance with water: your surfboard’s nose, your legs, your arms, your surfboard’s rails, etc. Lots of resistance means you are slowing yourself down and paddling to a fraction of your potential. 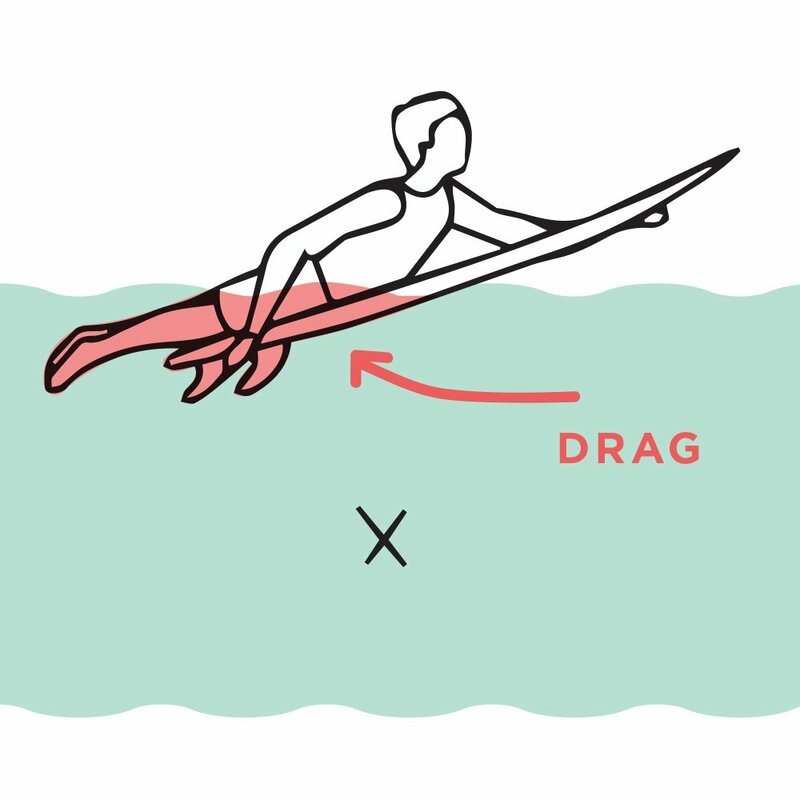 To minimize resistance, or drag with the water, you basically need to have the right position on the surfboard. It’s about finding the “sweet spot” on your surfboard: being at the right place on the surfboard, both vertically and horizontally. 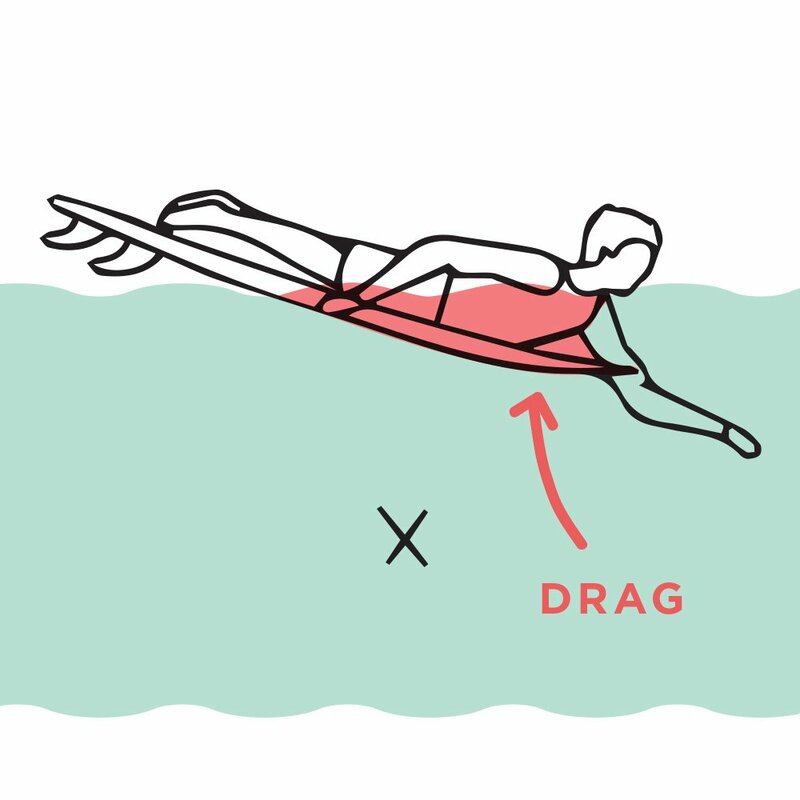 The spot where your chest lays down on the surfboard, and how your body weight is distributed on the board will make the difference between creating tons of drag, or “gliding” on the water efficiently. This surfer keeps his back arched & his surfboards nose slightly out of the water. You should pretend there’s a soccer ball under your chin. This will make sure your head stays up and still, and keeps the arch in your back. The surfer above is positioned too far back on his surfboard. His nose is more than a foot out of the water. In this position, Surfer B is probably swimming at less than half of his potential. His surfboard creates a lot of resistance with water underneath him. Here, the surfer is too far up on his surfboard. Consequently, his nose dives in the water, either creating more resistance, or eventually making him fall off his surfboard. 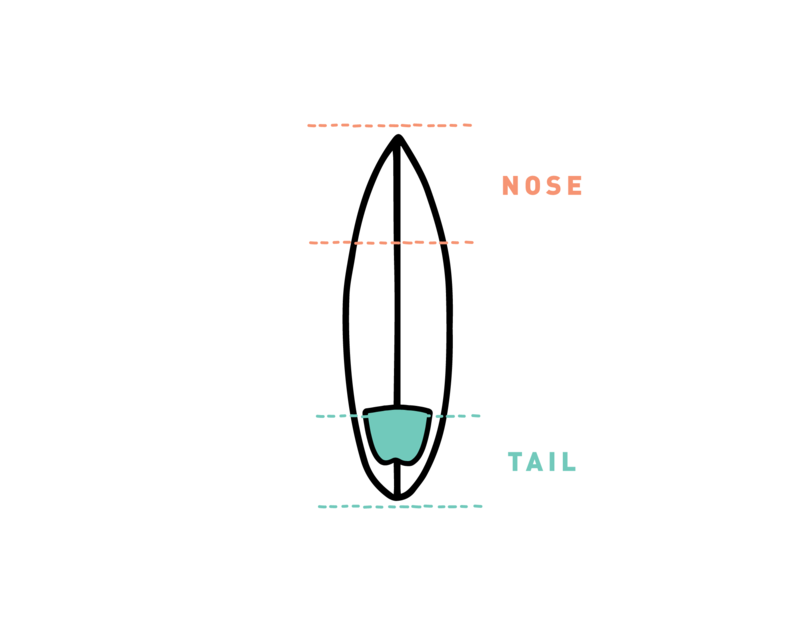 ✓ The optimal vertical position on your surfboard is placing your body high enough so the nose is only 1 or 2 inches out of the water, but not too high, so you prevent the nose from diving in the water. ✓ Make sure your nose is 1 – 2 inches out of the water when your back is arched. 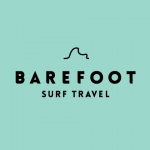 ✗ You could think that you are at the right position on the board, with the nose being 1 – 2 inches out of the water, when actually you are too far back on the surfboard. This often happens to novice surfers that keep their head, which weights about 10 pounds, too close to the board. Your head puts weight in front of your surfboard, giving you the impression you are at the right place because your nose is 1 – 2 inches out of the water. If you arch your back, pretending you have a soccer ball under your chin, you will see the nose pop out of the water a lot more than 1 or 2 inches. This surfer has her body at the center of the board horizontally and is perfectly balanced. 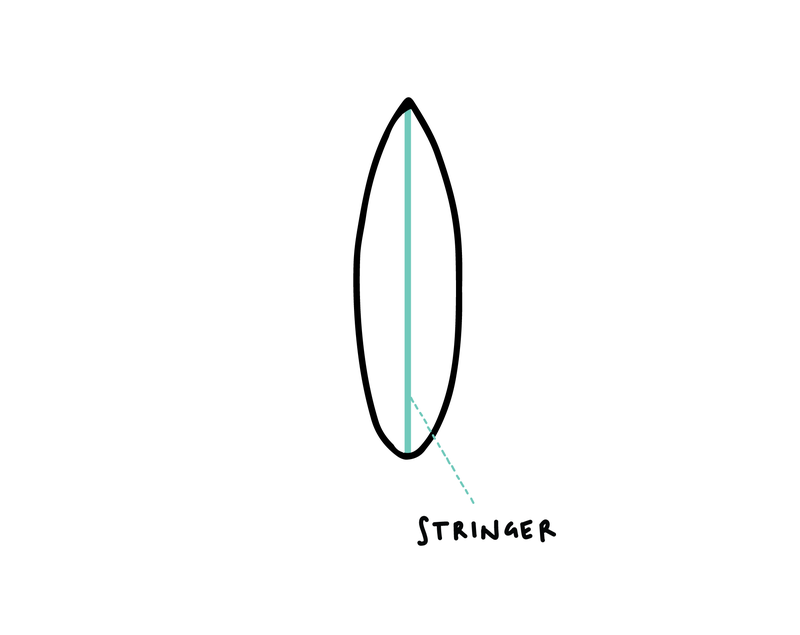 The stringer (wood strip that commonly runs down the middle of your board) should be running perfectly straight along the center of your body. The surfer above does not have her body straight along the center of the board. The board will sink on the side where there is most weight. The sinking part of the surfboard then creates resistance with water while moving forward. Here, the surfer compensates her uncentered position using her legs to help stabilize the board. This is a common mistake for 2 reasons. First, the legs might sink in the water and create drag. Second, this might lift the tail and cause the nose to dive in the water. ✓ Lift both hands out of the water before you start paddling. Are you balanced? You will sink on either side if not properly centred. Adjust your body position and make sure you are balanced before paddling. ✓ Keep your head and upper body still when you paddle. Moving your head and upper body from side to side while paddling will “rock” your surfboard from side to side, creating more resistance. Maximizing propulsion is done with the correct paddling technique. Maximizing propulsion is about the getting the most power out of every paddle stroke. The goal is to maximize the surface area (hand, forearm & arm) that pushes water underneath. The greater surface area reach for, the more water you push, the faster you paddle and the more waves you catch. Surfer 1 paddles with long, full range motions. His front arm is fully extended so his hand may penetrate the water far in front of him. His back hand pops out of the water only when it is fully extended in the back, after a full range motion. Surfer 2 has his hand and forearm penetrate deep under water, and vertically. When your hand and forearm go deep under water and stay vertical, you are able to hold a greater surface area and propel yourself forward with more power. Surfer 3 has his elbow high at the moment his hand penetrates the water. This is the best way to make sure your forearm stays vertical once it goes under water. Surfer 4 is doing short range motions. This limits his propulsion. You only propel yourself forward for the short amount of time when your hand and “semi” forearm are actually under water. 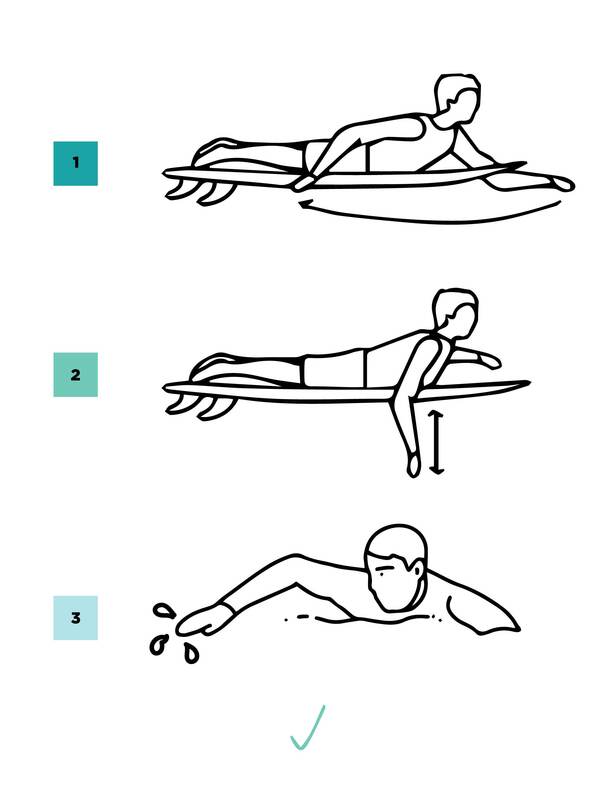 Surfer 5 does not penetrate deep under water and his forearm isn’t vertical. The surface area he holds is very limited, creating very weak propulsion. Surfer 6 does not keep his elbow high when his hand penetrates the water. His forearm will not be vertical under water, which will limit his propulsion. He can also create drag as is hand or forearm may “splash” water on the surface when paddling. Surfer 1 bends his arms when reaching forward for the next paddle. He also keeps a rhythm, paddling one arm at a time. Surfer 2 keeps his arms stiff when paddling. This is commonly called the “windmill” paddling. Keeping your arms stiff will make your shoulders tired quickly, as they will have to support your arms weight with each paddle stroke. This will also make your surfboard rock from side to side, creating drag and slowing you down. Don’t splash water when penetrating, do a smooth quiet entry. Fingertips are what enters the water first. Do not put your hands in a “cupped” position. This reduces the surface area your hands push under water, limiting your propulsion. Do not put excessive tension in your hands, this is a waste of energy. Keep your hands straight and relaxed under water. Don’t paddle two arms at the same time. The best way to keep your energy and to surf for many hours is to paddle one arm at a time, keeping a good rhythm. Don’t paddle wide. You should bend your arms when paddling. 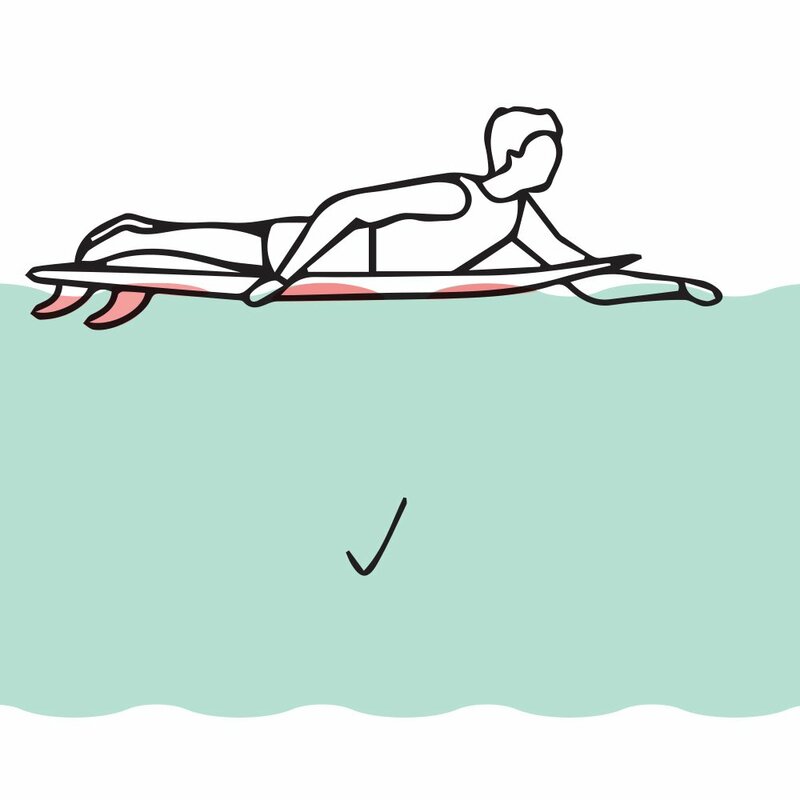 Your arms should be close to the surfboard’s rails, not going wide on each side. Don’t rest your head on the surfboard. Always pretend there’s a soccer ball under your chin. Keeping your head up gives you more stability, more mobility and more visibility of the waves in front of you. Don’t roll your shoulders too much on each side when paddling. You don’t want to throw weight on each side of the surfboard, rocking from side to side and creating drag. Don’t spread your legs on each side to try balance yourself. Always keep your feet close together. 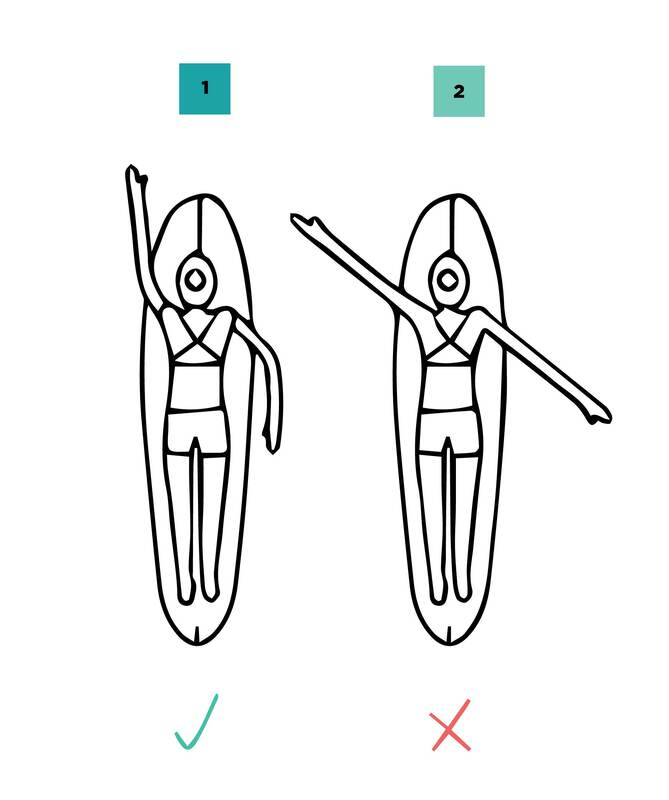 If you feel you are unbalanced and falling on one side, reposition your body to the centre of the surfboard.